The dilution refrigerator is the coldest cooling stage for the CUORE detector. It keeps the crystals cold enough that the heat can be detected from a single radioactive decay. The purpose of CUORE is to study the energy spectrum of these decays, so it’s vital that the surroundings be cold. Here’s how it works. CUORE is looking for a kind of radioactive decay that’s extremely rare if indeed it happens at all. It’s never been observed before. It’s called “neutrinoless double beta decay:” a decay emitting two electrons but no neutrinos. Lots of radioactive elements undergo beta decay and emit electrons. Some emit two at once, in a double interaction. That’s accompanied by two neutrinos. The special case that CUORE investigates is the theoretical possibility that the neutrinos annihilate each other before the interaction is completed, so no neutrinos come out. This can happen only if neutrinos are their own antiparticles, which is an amazingly interesting possibility. Whether or not neutrinos are their own antiparticles is one of the great open questions in neutrino physics today. In the process of investigating this, we also will learn about absolute neutrino masses, two neutrino double beta decay, and a whole host of experimental techniques. Making the detector profoundly cold makes this search possible. Heat is the main signal, so any extra heat floating around is background noise. But additionally, the signal itself gets stronger at lower temperatures. The heat capacity is a strong function of temperature: the colder you go, the less heat it takes to create a change in temperature. So by making the detector colder, the amount of heat deposited by a single decay creates a larger change in temperature, making it more distinguishable from background noise. The temperatures we’re considering here are measured in millikelvin. For perspective, let’s look at some other cold things. At the South Pole (where my grad school experiment IceCube is) the outdoor temperature ranges between 0 and -100 Fahrenheit, or 255 to 200 Kelvin (K). Liquid argon boils at 87K. Liquid nitrogen boils off at 77K. The cosmic microwave background is at 2.7K. The temperature we’re hoping to use is 10mK or less, which makes CUORE the coldest cubic meter in the universe. The advancement CUORE represents isn’t simply the temperature but also the volume. It might not be the coldest place in the universe, but it’s the coldest place as big as a cubic meter. There’s a trick we use to cool down our helium so much. Helium comes in two isotopes: 3He and 4He. When they get cold enough, both of them become superfluids, but at different temperatures: 2.2K for 4He and 1mK for 3He. The refrigerator operates between these two, so the 4He is superfluid but the 3He is only a regular liquid. By simple 3He evaporation, we can get it down to about 300mK. The key to our trick is that when you mix the two isotopes together, the mixture can become even colder than either would be individually. It splits into two phases, and by making one phase change into the other, we can pump out more heat. When you cool a mixture of 3He and 4He to very nearly zero (below 867mK), the mixture separates into two different phases. 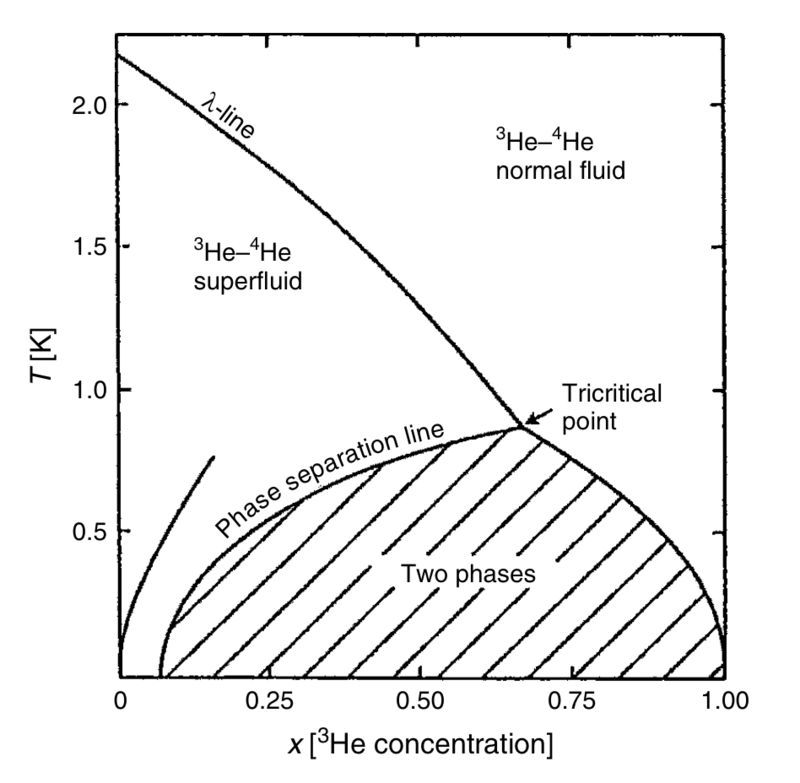 One phase contains more 3He, so we call it the concentrated phase. The other contains less 3He, so we call it the dilute phase. We have a tube going down into the dilute phase and pumping away 3He, shifting the balance of the concentrations in the two phases. As we pump away 3He from the dilute phase, more 3He changes phase from the concentrated phase to take its place and maintain an equilibrium. 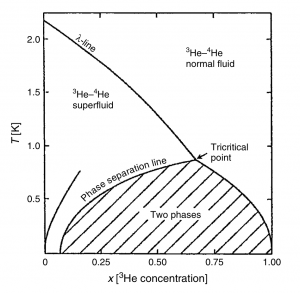 As each atom changes phase, it absorbs heat because of the lower enthalpy in the dilute phase. The faster we pump out 3He, and the more 3He changes phase, the more cooling power the system has. The power of the cooling engine in limited by the interface area between the two phases, so large area makes more power. The process of cooling something by pumping away from the dilute phase shows up in another, more familiar context: it’s the same process as when we cool tea by blowing away the steam. More tea can evaporate, cooling what remains. Throughout this process, we follow the 3He for “dilute” and “concentrated” naming conventions for a couple of reasons. First, the stuff that’s circulating through the system is nearly all 3He and only a little 4He. The 4He stays in its superfluid state within the mixing chamber while the 3He is pumped through condensing lines. There can be a tiny tiny bit of 4He that creeps along the tubes up the pumps (yes, “creep” is the technical term to use here, literally), where it can evaporate and be pumped along with the 3He, but that’s usually less than 1%. The second reason we follow the 3He is that it’s extremely expensive and rare, but that’s a different topic, and it involves international politics in the nuclear age. Image from F. Pobell: Matter and Methods at Low Temperature, 2nd ed., Springer-Verlag, New York (1995), via G. Ventura and L. Risegari: The Art of Cryogenics Low-Temperature Experimental Techniques, Elsevier, Oxford (2008).